Caption slip reads: "Photographer: Brunk. Reporter: Ostler. Assignment: Bendicion de los Animales. Olvera street. 5/6: John Park and Ernestina Carrasco on horse in re-enactment of historic story of the Mission Bell. 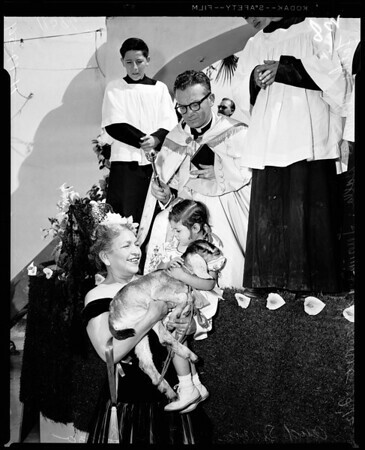 7: Gen. view of Father Clarence Golla, pastor of Our Lady Queen of the Angels' Church blessing animals. 8: Father Clarence Golla blessing kid goat of 2 1/2-year-old Juanita Goarare being held by Senora Consuelo Castillo de Bonzo".